This week, not only is superstar conductor Gustavo Dudamel guiding Mendelssohn’s music in Shakespeare’s play, A Midsummer Night’s Dream, but he’s also bringing Mozart’s masterworks to the fore. 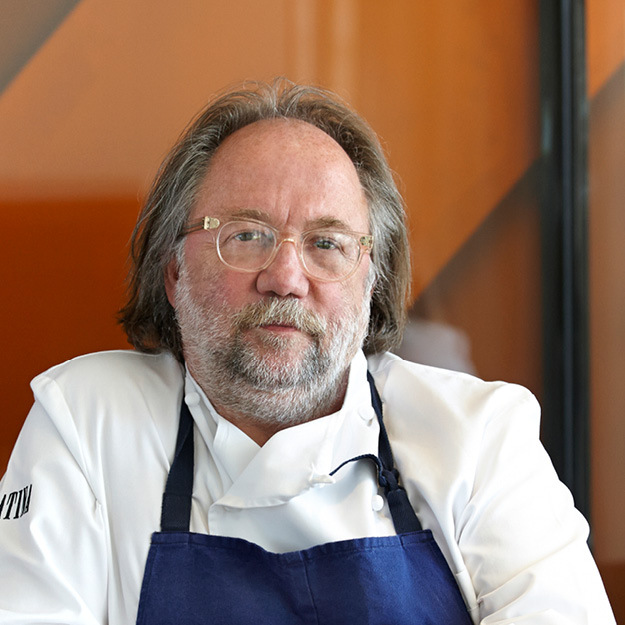 Chef Joachim Splichal, Dudamel’s neighbor at Walt Disney Concert Hall, is a star in his own right: not only does he helm the Michelin-starred restaurant Patina but also oversees the highly-acclaimed Patina Catering as well as myriad venues around town. Combine all into a tall cylindrical container, puree with a large immersion blender –OR– puree in a vita-mix blender in batches, combine all and check seasoning. Rinse the quinoa thoroughly with cool water for about 2 minutes. Rub and swish the quinoa with your hand while rinsing. Drain. Heat a drizzle of olive oil in the saucepan over medium-high heat, and add the drained quinoa. Cook, stirring, for about 1 minute to let the water evaporate and toast the quinoa. Stir in water or stock and the salt. Bring to a rolling boil. Remove the pot from heat and let stand for 10 more minutes, covered. Don’t peek! Remove the lid — You should see tiny spirals (the germ) separating from and curling around the quinoa seeds. Fluff the quinoa with a fork while adding in the remaining ingredients, season to taste with salt and pepper and lemon juice. Cream the butter and sugar. Add in the egg and milk, mix until smooth. Add flour, baking powder, salt. Mix until smooth but do not over mix. Pour into the well greased pan. Make streusel topping. Cut in sugar, flour, cinnamon into the butter until well combined. Sprinkle over the top of the cake. Bake at 375 degrees for 40-45 minutes or until a cake tester comes out clean. Yield: one 9” square dish, pre heat oven to 375 degrees, grease the pan. Gustavo Dudamel transforms the Bowl into an enchanted forest via an all-Mendelssohn program, with superstar violinist Gil Shaham in the iconic concerto and Mendelssohn’s magical music for Shakespeare’s beloved play. Showcasing the many sides of Mozart, Music and Artistic Director Gustavo Dudamel brings a special evening of masterworks from Salzburg’s favorite son, from beloved opera arias to beautiful orchestra selections. This hilarious adaptation of the 1975 classic film Monty Python and the Holy Grail will have you rolling in the aisles with laughter amidst a bevy of beautiful showgirls, not to mention cows and killer rabbits…and French people…and monks.